"Don't blame me, blame the RNG!" Fire Emblem: Three Houses got announced officially! Nice! FINALLY! Anyway, day of, I tried to quickly whip this up after figuring out who I assume to be the 3 main leads and the tactician (Edelgard in red - axe user, Dimitri in blue - lance(?) user, Claude in yellow - bow user, and Byleth in greenhair - sword user?). Who knows what their personalities actually are, but I tried. Here's Byleth yelling at Edelgard for probably a terrible levelup. xD Also, Dimitri has terrible greasy crisscrossing hair and is a fanartist's nightmare. Emm, I think you got one thing wrong my friend, Dimitri is a lance user, you can see it in the trailer. it looked it it could have been a fencing sword but haha, I gues sit makes sense if he were a lance user just to cover the weapon triangle! I'm super hyped to see the game! YEAH! Though I hope they improve the graphics/animations and possible battle speed still! 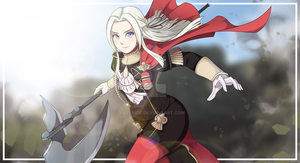 Haha yeah, Edelgard is a cutie! Reminds me a bit of Micaiah!